Sep 14 (AZINS) On Friday, the Supreme Court of India held that scientist S Nambi Narayanan was unnecessarily arrested, harassed and subjected to mental cruelty in ISRO spy case. The SC also awarded Rs 50 lakh compensation to the ISRO scientist, for being subjected to harassment and mental trauma. While absolving the former ISRO scientist, the SC said that a committee headed by a former SC judge will look into the role of erring officials who 'cooked up the case' against him. Narayanan was acquitted by a trial court in 1994. A bench of Chief Justice Dipak Misra awarded Rs 50 lakh compensation to 76-year-old Narayanan for being subjected to mental cruelty in the case. The bench, also comprising Justices A M Khanwilkar and D Y Chandrachud, formed a three-member panel headed by its former judge D K Jain to probe Narayanan being framed in the spy case. Narayanan had approached the apex court against the judgement of the Kerala High Court, which said no action was required to be taken against the former DGP and two retired superintendents of police K K Joshua and S Vijayan, who were later held responsible by the CBI for the scientist's illegal arrest. In 1998, the apex court granted compensation of Rs 1 lakh to Narayanan and others, who were discharged in the case, and directed the state government to pay the amount. He later approached the NHRC claiming compensation from the state government for the mental agony and torture suffered by him. The NHRC, after hearing both sides and taking into account the apex court judgement of April 29, 1998, awarded him interim compensation of Rs 10 lakh in March 2001. He has said the division bench had "failed to appreciate the real undercurrent that passed through the mind of the apex court, the National Human Rights Commission (NHRC) and the single judge of high court in their verdict and on untenable reasons, quashed the order of the single judge". In 2013, the BJP had alleged that former Gujarat DGP R B Sreekumar had earlier fabricated the ISRO spy case of 1994 which he had probed while on deputation with the Intelligence Bureau. BJP had alleged that Sreekumar levelled charges of fake encounters against the Narendra Modi's government as a quid pro quo for the UPA dispensation giving him a clean chit in ISRO spy case "fabricated" by him. The case has also caused an internal strife in Kerala Congress where they believed the case had been used to oust late Kerala CM Karunakaran from his role. He was, however, given a clean chit by the UPA government in 2004. In return for this, The BJL alleged, he launched a tirade against the Modi government when he was posted back to his parent cadre, Gujarat. 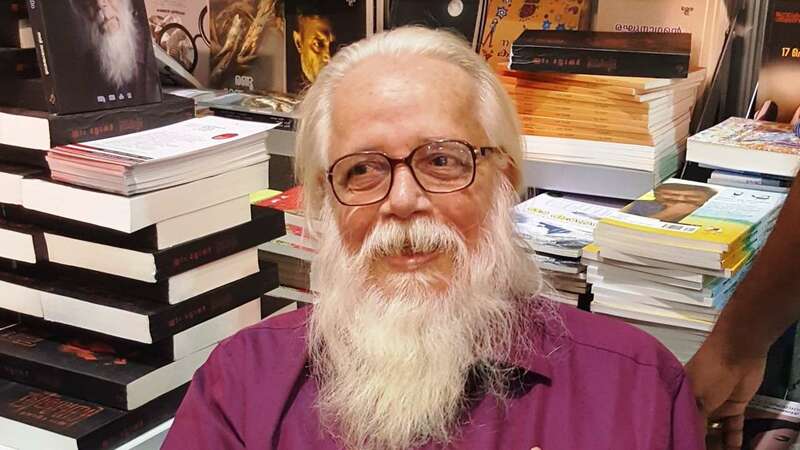 The 76-year-old former ISRO scientist Nambi Narayanan had filed an appeal against the judgement of division bench of the Kerala High Court which had said no action was required to be taken against the former DGP and two retired Superintendents of Police, K K Joshua and S Vijayan, who were held allegedly responsible by the CBI for his illegal arrest. The apex court had in 1998 granted compensation of Rs one lakh to Narayanan and others who were discharged in the case and directed the state government to pay the amount. Later, Narayanan had approached NHRC claiming compensation against the state government for mental agony and torture suffered by him. The NHRC, after hearing both sides and taking into account the apex court judgement of April 29, 1998 awarded an interim compensation of Rs 10 lakh on March 14, 2001. Challenging the legality of the high court's division bench order, he had said it was "bad in law" and sought an interim stay contending that "the illegality in the judgement impugned, if allowed to perpetuate, would only encourage the unlawful action and mindset on the part of the Kerala police to harass innocent persons for extraneous considerations. "And unless action as suggested by the CBI is immediately taken, (possibly under the provisions of Section 195 of the IPC if for any justifiable reason departmental action could not be taken), the innocent public would suffer at the hands of the Police." Narayanan has said it was hence "appropriate that the impugned judgement of March 4, 2015 of the High Court of Kerala... is stayed and the State Government initiate action as deemed necessary during the pendency of this SLP."